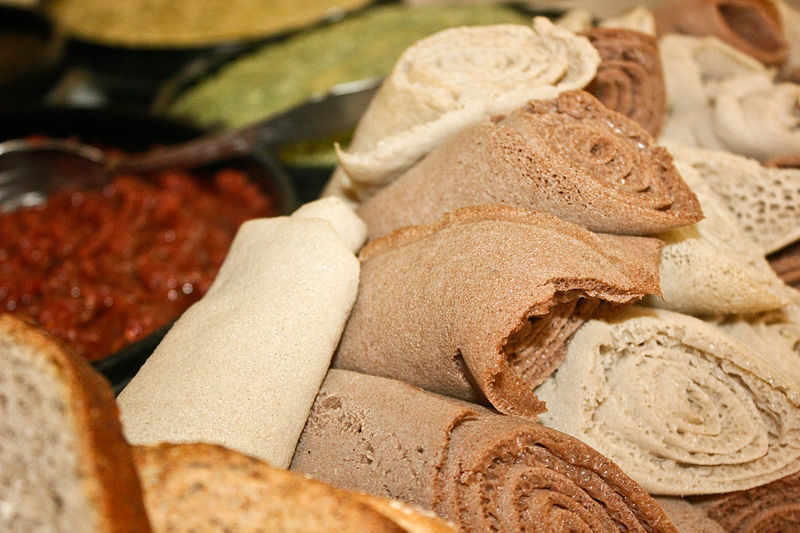 Teff is one of the oldest grains to have been cultivated, a staple for so long that its original cultivation date is lost to history and can only be estimated at between 1000 and 4000 BCE; it is best known as the main ingredient in injera, the soft pancakes that are served with Ethiopian meals. In 2003, a Dutch human named Jans Roosjen filed a patent on teff, claiming to have invented it, and demanding a halt to virtually every means of preparing the grain. Roosjen ran an agronomy corporation that partnered with the Ethiopian government to market teff in Europe, which then went bankrupt after paying Ethopia a mere €4000. But before the bankruptcy, Roosjen and his company had filed their patent application by lying and claiming that the manner used for storing and processing teff was a novel invention. As the patent holder for teff, Roosjen struck lucrative deals with other EU companies -- and froze Ethiopia and its people out of access to European markets. Ethiopia itself lacked the resources to invalidate Roosjen's patent, so it remained in force until Roosjen threatened another Dutch company for making teff without paying him for a license. Roosjen's patent was invalidated in 2014, and this week, the deadline for an appeal passed, meaning that the patent is now permanently dead. Intellectual property is a grifter's best friend: grifters aren't mere con artists, they're the impressarios of immersive LARPs in which you are guided to signing contracts that say that everything you own is really something you misappropriated from them, and by continuing to use your stuff, you are nothing but a lawless cur. The connection between IP trolling and settler colonialism is strong and not coincidental. If you're going to claim that something everyone is using belongs to no one, then it helps if the people you're misappropriating have no access to power or justice. In some ways, Roosjen is just Aloha Poke, by another name -- a scam that steals an ancient foodstuff, and not just an ancient word. Following the controversy of French and American companies trying to trademark rooibos tea, South Africa sought and won a “geographic indicator status” over the product, meaning goods made in the country and approved by the government could only use the name. In Kenya, Benin, Nigeria, and beyond, artists and museum curators are also seeking the return of looted artifacts kept in Western museums across the world. During the bitter debate over the EU's Copyright Directive, with its mandate for copyright filters that would automatically censor anything that anyone claimed to be infringing, opponents repeatedly warned that these filters would be trivial to abuse.